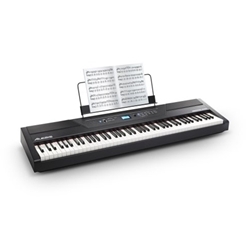 The Alesis Recital Pro is an 88-key digital piano designed to provide a realistic playing experience and education-friendly features for beginning keyboardists and experienced pianists in rehearsals, at home, or on stage. It delivers natural response via 88 hammer-action keys with adjustable touch sensitivity. There are 12 voices including acoustic and electric pianos, organs, strings, bass, and more, and each sound has a corresponding demo. Ten additional demo songs are available for reference and practice. An adjustable metronome with an LED indicator allows you to play along with a stable tempo, ideal for improving consistency. Layer, Split, and Lesson modes enable customization of voice layers and keyboard zones. Record and play back a performance without the use of an external device. Listen through the built-in stereo speakers, or utilize the 1/4" stereo headphone and line outputs to monitor through headphones, speakers, or a PA. Sweeten your sound via integrated effects such as reverb, chorus, modulation, and EQ. A USB Type-B port offers simple connectivity for controlling virtual instruments in your favorite DAW. The Recital Pro ships with a power adapter and removable music rest. Ten demo songs: Fantaisie-Impromptu in C# Minor Opus 66, Etude Opus 25 No. 1, Polonaise No. 6 in A Flat Major Opus 53, Sonata No. 16 in C Major, Toccata and Fugue in D Minor, Prelude and Fugue No. 30 in D Minor, Prelude and Fugue No. 1 in C Major, Suite of Minuets in F Major, Danse des Mirliton, and the Wedding March.